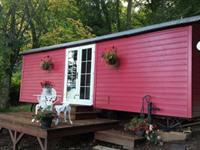 A delightful Shepherd's Hut set in the stunning Scottish Borders Village of Roberton. A larger than average Shepherds Hut set in the of the Borthwick Valley makes the Hut the ultimate destination for a romantic weekend away if you fancy something different from the conventional cottage. Opening the stylish french doors, reveals a charming living area and with everything you need at arm's length you need look no further. Decorated in a delightful rustic style with the smell of new wood all around the hut is decorated with warm soft furnishings, soft tartan schemes to give a really homely stay in the stunning Scottish Borders. A cosy warming hut, perfect if you like being original without being apart from the creature comforts of a traditional holiday let. There's no hassle with fold down beds as the comfortable full size double is a permanent fixture with a large storage drawer underneath to hide the suitcases! Once you are in, all facilities are on the same level and you are all set for a comfortable night's sleep. The kitchen/diner is complete with freshly painted wooden cupboards with a chunky Ash worktop and Belfast sink incorporating a full size Electric oven and ceramic hob with integrated fridge. The en-suite has a double sized cubicle with electric shower where traditional style sink and toilet and vintage fixtures and fittings complete the look! You are instantly immersed in the Borders countryside, with a rustic decking area where you can sit at the bistro table admiring the world go by, or venture down into the woodland garden with a chimnea and logs for a romantic evening with a picnic bench to relax and dine alfresco! Witness a clear un-spoilt star lit sky and watch the wildlife dance by, be astounded by the peace and quiet.